Buy now and pay easily and securely by direct debit, credit card or with . The download link and the activation code will be visible immediately after payment and is also sent to your email address specified at your buy. The coupon code has been applied. 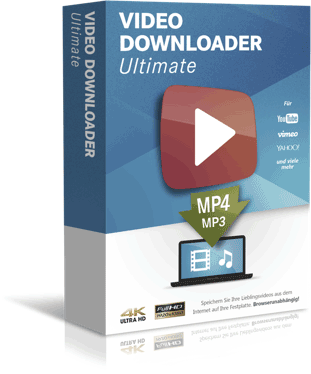 Important: After purchase you will automatically receive the code by email from noreply@videodownloaderultimate.com. If you don't receive it, please check the spam folder in your email program. * One-time license price (no subscription! ), all future updates are free! If you experience technical problem when buying a license, or if you have any further questions to help decide - please contact our support. Operating system(s): Windows 7, Windows 8, 8.1 and 10. Video Downloader Ultimate is currently only available for Windows. Your personal data are processed by us only in accordance with the provisions of German data privacy laws. On this website, personal data will only be collected for technical required purposes. In no case your data will be sold or transferred to third parties. We cannot assign these data to specific individuals and we do not merge these data with other data sources. The data are deleted after statistical evaluation. In addition, we also save the activation code provided by us. We do not receive or save any account number, credit card numbers or other payment details. Further information about the PayPal privacy are available here. If you send a message via contact form or by eMail inquiries, this information including your eMail address is stored in order to process the request and in case of follow-up questions. We do not share this data with third parties. Your personal data will only be kept for as long as necessary for the provision of our services. Occasionally, data storage beyond that may be required due to legal or (tax) legal obligations. Our website is using Cookies. They are used to remember certain settings for later visits of our website. Cookies are small text files which are saved by the browser on your system. Cookies do not harm your computer and do not contain viruses. You always have the right to receive information regarding your stored personal data, its origin and the purpose of storage. Please contact our customer support to receive information about the data stored. You can also request the deletion of your data. Please contact us if you would like to receive information about the personal data we hold about you. Of course, we provide you with this information promptly and free of charge. This information may also be transmitted electronically to you.